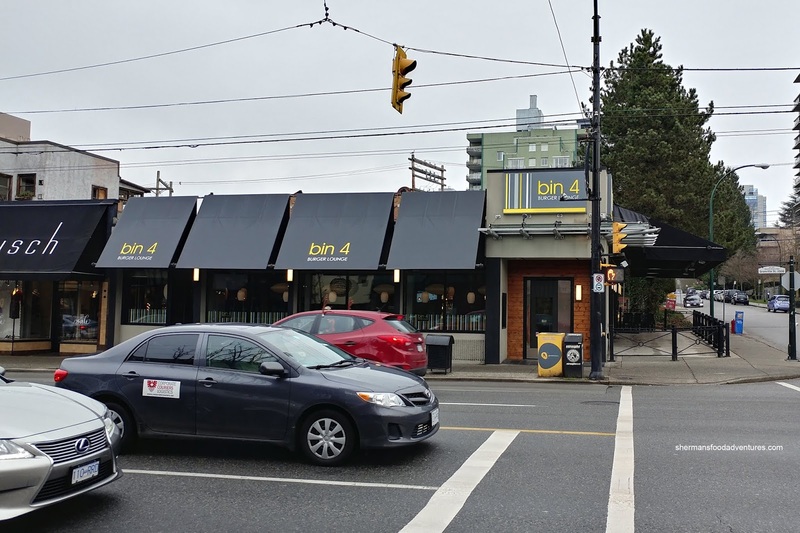 Ever since my first ever visit to Bin 4 Burger Lounge in Victoria last year, I've been hoping they'd open up a location in Vancouver. Well, that didn't take long as they set up shop on Granville at 14th late 2017. I made it out there pretty quickly to discover that they were just as good as I had remembered. What I also discovered was that their kid's menu was an insane value as you nearly get a full-sized order for a fraction of the price. On that note, we recently found out about their 1/2 burgers after 9:00pm as long as you purchase a beverage (including pop). We ended up visiting the place several times after softball. 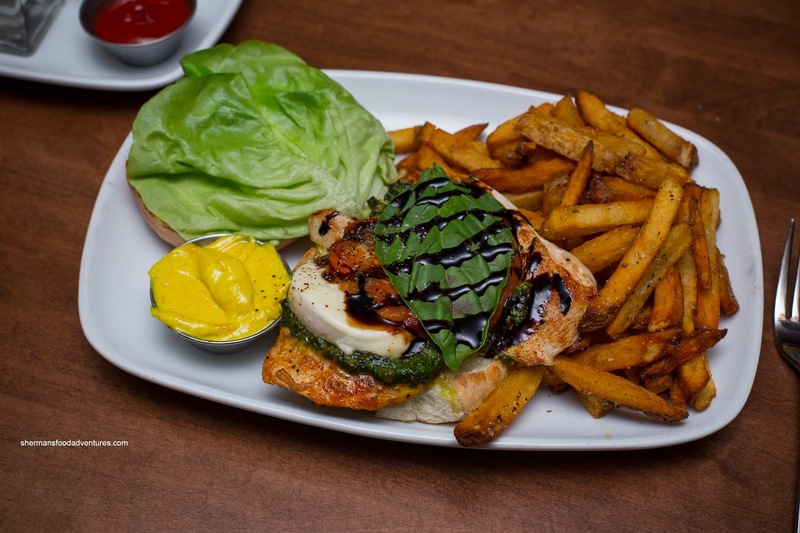 On our first go around, I decided to try something other than red meat in the Delizioso with Rossdown Farms free-range chicken breast, basil pesto, grilled tomato, bocconcini, fresh basil, balsamic reduction, cracked pepper, basil aioli and butter lettuce. I found this combination of ingredients to be fairly light and mild-tasting. There was a noted herbaceous slant to the flavour profile thanks to the 3 applications of basil. The chicken was beautifully seared while remaining tender and almost juicy. 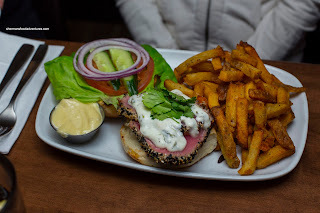 Judes also shied about away from red meat and decided on Chicken of the Sea consisting of seared rare sesame crusted Ahi tuna, olive tapenade, chipotle aioli, cucumber, fresh cilantro, cilantro yogurt, butter lettuce, tomato and red onion. As evidenced in the picture, the tuna was perfectly rare, buttery and fresh-tasting. Much like my burger, this one was mild and light. It ate easy and the cilantro really came though. Pom Pom went for the Dirty Bourbon consisting of 63 Acres premium BC beef, onion ring, pork & chorizo, red onion & red pepper saute, chipotle bourbon BBQ sauce, chipotle aioli, butter lettuce and tomato. 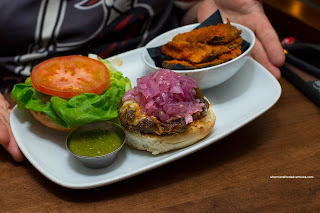 As with my previous experience with this burger, the flavours were more sweet than spicy. 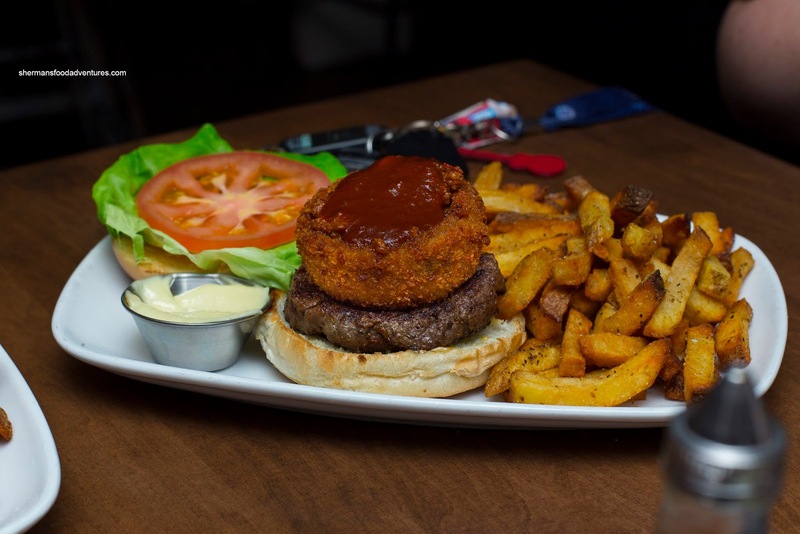 This was a hearty concoction with the combination of beef patty and the rest of the meats hidden in the crunchy onion ring. 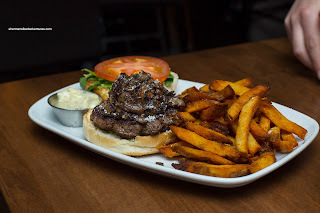 With the unmistakable smell of truffle oil, we sensed the Wild Mushroom even before it hit the table. In addition to the mushrooms and truffle oil, there was garlic, cream, parmigiano, truffle aioli, baby arugula and tomato. Predictably, the burger was woodsy with plenty of umaminess. Despite the presence of truffle oil and aioli, it wasn't used too liberally. Bam Bam chose the Black & Blue that featured a blackened beef patty, Ermite blue cheese, jalapeno and sweet onion relish, chipotle aioli, butter lettuce and tomato. As such, there was a crust on the patty that was smoky and crispy. As much as there was blue cheese present, it wasn't overly strong. The ample relish on top was indeed sweet and provided a nice counterbalance to the heartiness of the patty. On the side, he subbed Fried Pickles and they were uniformly crunchy. 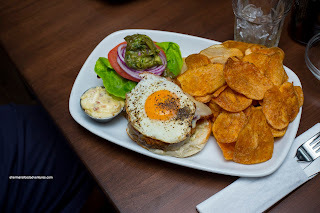 R2D2 wanted to compare with Bells & Whistles (All-Day Breakfast Burger), so he had the Breakfast Club consisting of a pork & chorizo patty, fried egg, Hertl's bacon, house made roasted jalapeno guacamole, roasted garlic aioli, 5 yr cheddar, butter lettuce, tomato and red onion. By virtue of being a completely different creation, this ate more like a burger than breakfast sammie. It was hearty with a nicely spiced patty aided by the robust flavours of the bacon and cheddar. Instead of fries, he chose the Spiced Potato Chips which were firmly crunchy. On our second visit, Bam Bam opted for the Bison Burner with a side of Wild Mushroom Gravy. That was a great decision as the gravy was super powerful with a smack-in-the-face umaminess. It was a touch salty, but it went well with the fries. 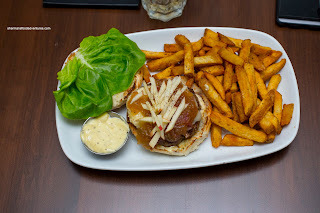 The burger itself was comprised of Rangeland bison, 5 yr aged cheddar, crispy fried onions, house-made lime & tomatillo hot sauce, jalapeno aioli, butter lettuce and tomato. In my opinion, this is one of the more impactful burgers on the menu. The slight gaminess of the meat combined with the sharpness of the cheddar added depth while the combination of the hot sauce and jalapeno aioli offered up tang and spice. 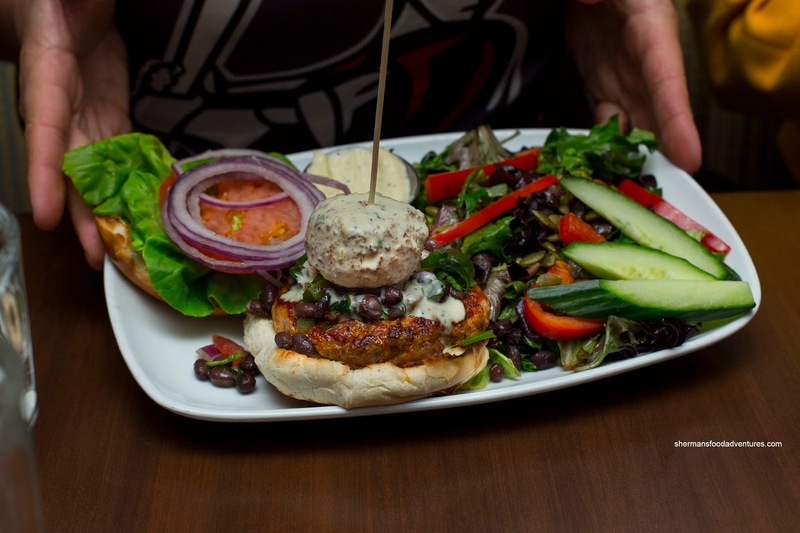 Sens Fan ended up with the Boss Hogg with a beef and chorizo patty, black bean salsa, panko-crusted deep fried goat cheese, avocado lime cream, chipotle aioli, butter lettuce, tomato and red onion. By virtue of the big ball of fried goat cheese on top, this was a hearty creation that had a bit of spice, tang and full of creaminess. 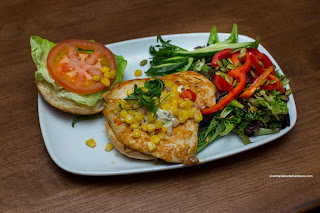 JR also went for chicken in the Sweet Corn & Chipotle. As the name suggests, the main component other than the beautifully seared chicken breast was sweet pops from the niblets. It was mixed into the red pepper and jalapeno salsa which added a tangy spice. There was also a small amount of cilantro, roasted jalapeno goat cheese, chipotle aioli, butter lettuce and tomato. The most noticeable of these was the goat cheese as it added a thick creaminess. 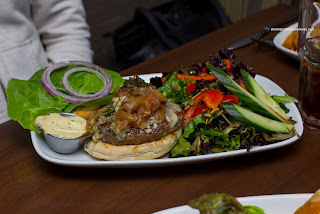 On her second go around, Judes had the Minted Lamb with eggplant & tomato relish, Ermite blue cheese, mint pistou, roasted garlic aioli, butter lettuce and red onion. The mildly gamy BC lamb patty was moist while decently seared. Despite being an ample amount of relish on top, it added mostly moisture rather than impact. On the other hand, the blue cheese was definitely there as well as the unmistakable taste of mint. 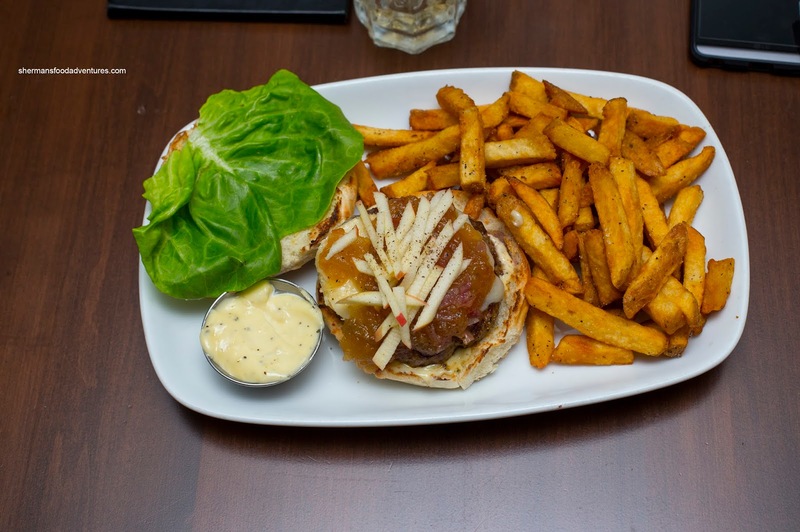 I went straight for their featured burger being the How Do You Like Them Apples consisting of a venison & pork patty, borgonzola cheese, apple & maple compote, apple sticks, apple gastrique, butter lettuce and garlic aioli. Even before I took a bite, I was expected it to be sweet. That it surely was with the maple really coming through. There was no mistaking the apple flavour. In fact, it somewhat obscured the cheese. I found the patty to be lean and slightly dry, but the compote added enough moisture to compensate. 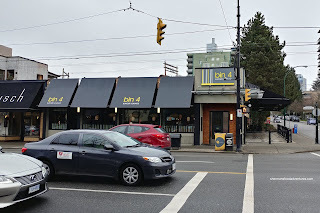 So going back to last year, I've visited Bin 4 a total of a half dozen of times (including Victoria). 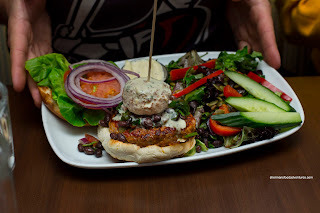 I can definitely say that their burgers are pretty good stuffed with quality ingredients. 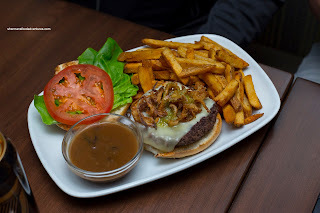 The beef patties can be on the drier side and the fries can be inconsistent, but overall, great stuff in my books. Can't beat the 1/2 price deal after 9:00pm either.